At the department of Chemistry atmospheric chemist Matthew Johnson invented and patented the air cleaning method which is based on the natural ability of the Earth atmosphere to clean itself. In a process triggered by sunlight, polluting gasses rising into the sky start forming particles when they come across naturally occurring compounds such as ozone. The newly formed particles are washed out of the atmosphere by rain. Once the rain hits the ground, the atmosphere is clean again. In other words the whole process is nature's own purifications works, explains Professor Johnson. Another win for green technology and human innovation. I did not see where the product may be acquired. Certainly the USA needs this sort of device in many places. This article reads like an advert. 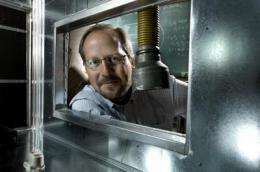 Under "Low energy consumption allows climate friendly air treatment", the article states "The method requires no filters, so maintenance is inexpensive. It consumes very little energy, so its climate impact is negligible." A photo on the infuser.eu website shows fluorescent tube UV light source in one of the sidebars. The bulbs probably consume less than 30W each if they are T-8 or T-5. Figure the thing uses as much power as your average tanning bed in total. Ingenious . If this thing actually works it will do wonders to fight pollution , soot etc. The kind of pollution that really needs to be stopped. But make no mistake , this device is going to do ZILCH with regards to big bad old CO2 , the evil gas thats spreading warming around the globe. "Once the rain hits the ground, the atmosphere is clean again. In other words the whole process is nature's own purifications works, explains Professor Johnson." I understand from this analogy that they gather the pollutants with water, but what do those pollutants become? They can't miraculously disappear, can they? The rains this scientist mentions do pollute the ground, don't they? Calling this "purification" looks like greenwashing to me.